Hi all, just want to share our little familiy happines. Well, it's been a busy and creative weekend in the Schaller house. I took some time to tackle my ever growing to do list and here is the first one. It is a custom of Bertie by Moopf which I have named Bertie Bot. He oozes green goo and has a tri-forked tongue which he uses to devour any gear he can find. Check out these Paper Desktop Speakers that were posted on Engadget this morning. They actually come with 1W stereo speakers, so I guess you won't be downloading to build yourself. The kit costs $21. Read more on Engadget. Monsieur Gami is the world famous multi-Michelin-star cook of the renowned "El Broccoli Atomico" restaurant. Since his restaurant is fully booked for the next two years, we decided to bring Gami Le Chef to your kitchen table! Hi ! My custom for "Calling All Cars" project by Horrorwood. 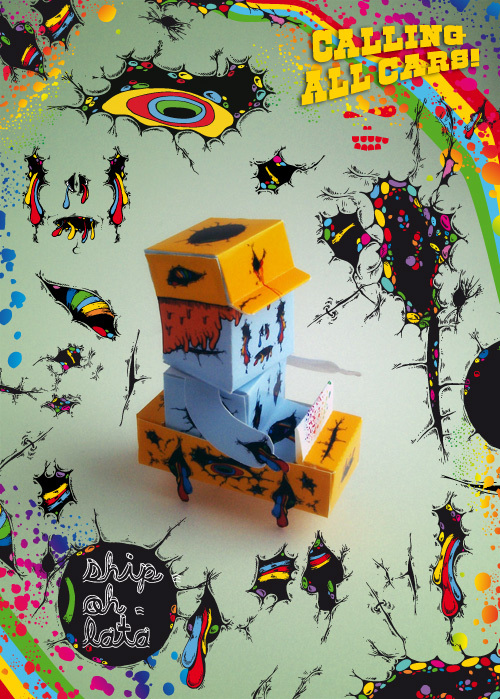 His name is Ship-Oh-Lata, a sort of psychedelic mystical alien living in colored dimensions. 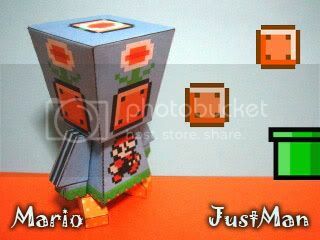 the people who are going to be in papercraft serise 1 are revieled! hankd ,glood ,Methuup da Funky One ,zakane ,one foot too big ,3 eyed panda ,oh-sheet ,Sal Azad ,pain and me. Here are the pictures I made for Marko Zubak's II Love Magazine, Issue 2. I had a good time making them! 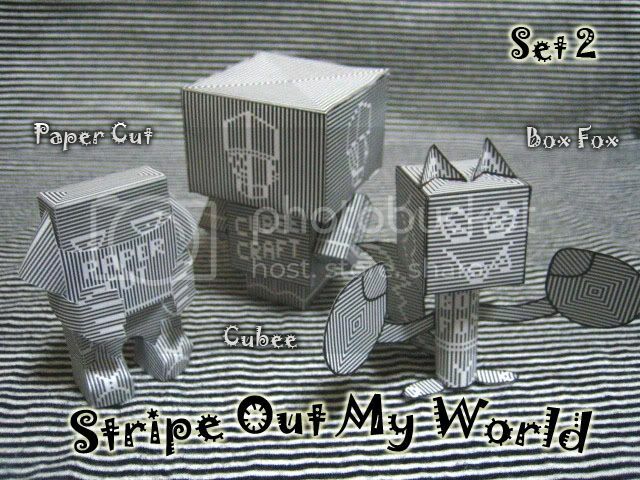 Stripe out my world - Set 2 ! Heres come the second set for 'Stripe Out My World' ! and heres an update on my JustMan. Another photo for my previous JustMan design. After a bit of thought and research, I've changed the name on my blog. As of now, the new address is http://theanywerechronicles.blogspot.com/ which I personally feel is vast improvement over the previous address http://anywereamateurreportersclub.blogspot.com/ I thought this was a bit of a mouthful, let alone a bugger to type! The second issue of II LOVE is finally ready for download! This is my first post here so I hope I'm doing this right. I've created a new papercraft. It's a Circus Mouse from the movie Coraline. Here is a picture of it.